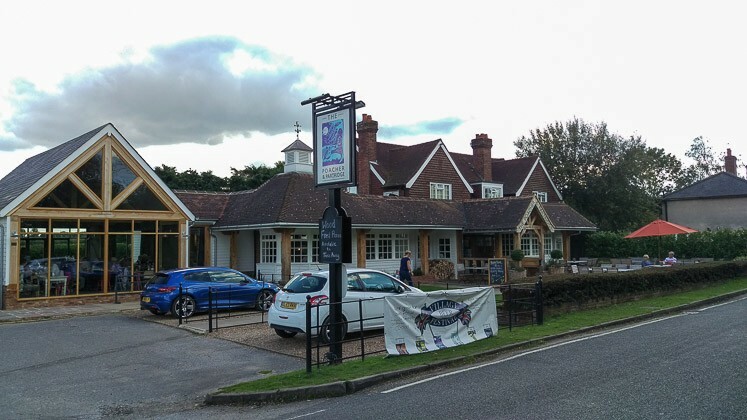 After visiting all the other pubs in the Elite Pubs group, we had one more to complete the set – The Poacher and Partridge. I booked for one Sunday for Claire, JW (our toddler – gluten, wheat and dairy free) and myself. A large car park with lots of space outside was a welcome change to many other venues. They also had a large garden with a good play area (similar in size to The Milk House in Sissinghurst). We went through the back entrance straight into the restaurant and we’re shown to our table. The decor was pretty, a nice mural of a man, dog and partridge adorned the wall. Mis-matched chairs and tables, along with wall-mounted antlers with a flat cap.The other part of restaurant was very airy. Essentially, think a modern country inn with contemporary decor, bright and fresh. There was also a pizza area/oven in the corner. We were given a kids pack with stickers and play / match cards to keep JW happy, always an appreciated nice touch. A pint of Sharps pilsner for me, glass of processo for Claire. We ordered a small roast lamb for JW, an adult portion of roast lamb for Claire and roast beef for me. The lunch was served very quickly – seemingly within a few minutes of ordering! The plate consisted of large roast potatoes, two large slices of beef, lots of gravy, carrots, cauliflower, green beans and cabbage. There was also a muffin-styled Yorkshire pudding and thick gravy. The beef was delicious, being cooked medium rare and very delicate. The roast potatoes were excellent, with a thick outside and nicely seasoned. The vegetables were cooked to my liking, being al dente. Gravy was wonderfully thick with great flavour. thick and nice, and I enjoyed the Yorkshire pudding. Also – cauliflower cheese… MMMmmmm. So, an excellent roast, now where is the dessert menu? I chose the sticky toffee pudding with honeycomb. 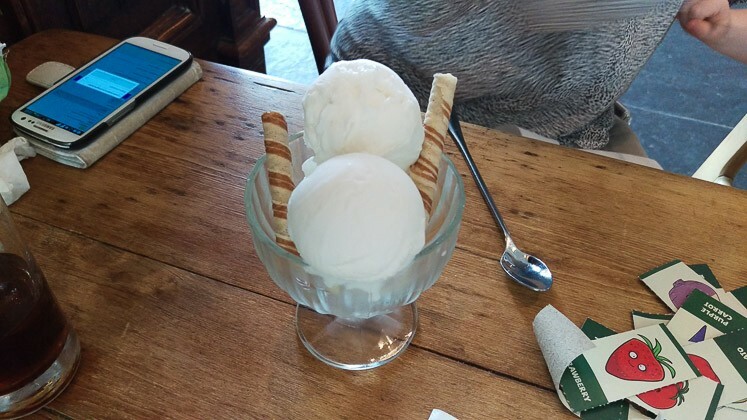 Claire ordered some sorbets – elderflower, lemon and passion fruit – which she shared with JW. 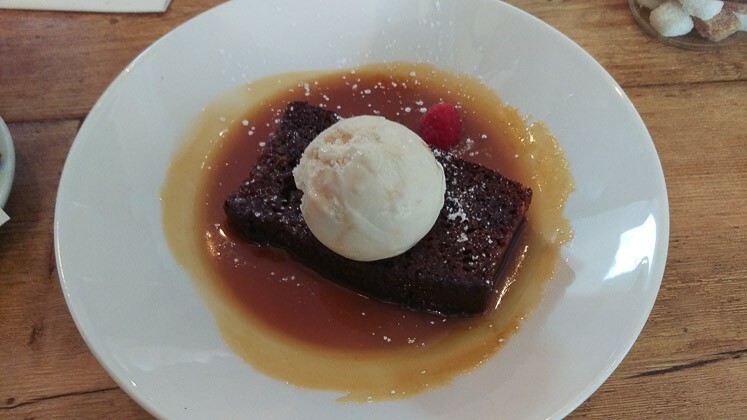 The sticky toffee pudding, with bouncy sponge, was very sweet, hot and tastey! A great sugar fix for the end of the meal. JW was welcomed at The Poacher and Partridge, a clean high chair along with a kids menu (stickers!). He was able to have a child’s roast too, so win-win. We didn’t need to use changing facilities, but I believe they had some available. We used the children’s play area outside, consisting of a wooden house / climbing frame and other apparatus. The garden was very nice actually, having deck chairs looking across the field opposite. 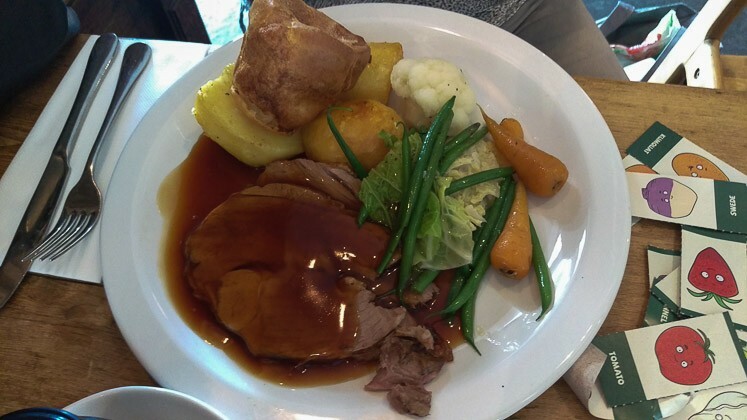 We were not disappointed with our Sunday lunch at The Poacher and Partridge – it is on par with the (other) Top Rated venues. 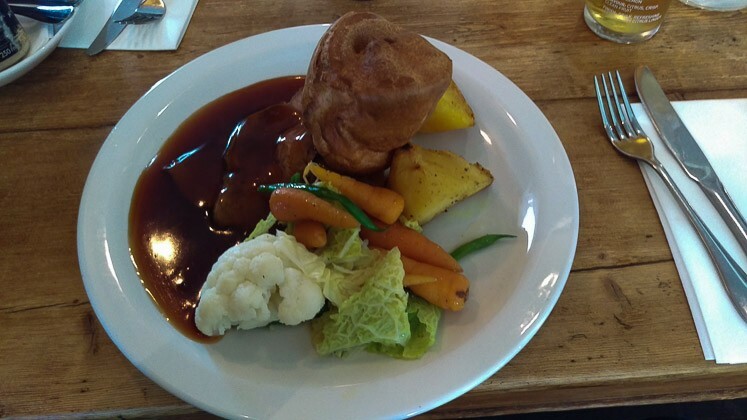 The service was excellent – very friendly, helpful and speedy with our food (I’m not sure if we have ever had our Sunday lunch served so quickly, which was great with a toddler). The venue was light and airy, and in good repair. 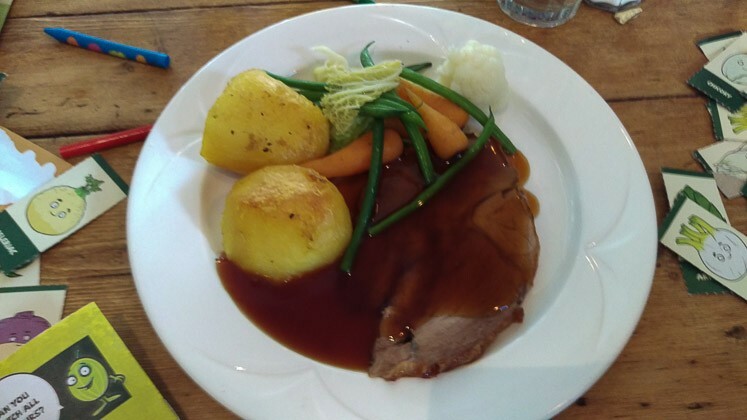 The food was superb, especially the roast beef and potatoes. Overall, a great Sunday lunch venue for couples, families and celebrations.